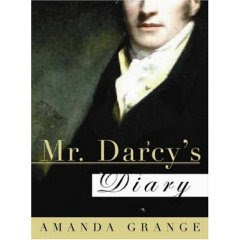 On Kate Walker's never-ending blog party (and believe me, I'm not complaining), I won a copy of Amanda Grange's seriously tempting Mr Darcy's Diary. It arrived in the post this afternoon. And I tried to resist. But how can a red-blooded woman resist Mr Darcy lying on her desk? So I dipped in. And I was immediately enchanted. There he was, writing his inmost thoughts, capturing so clearly the man behind the words we read in Pride and Prejudice. It's tricky to capture anyone else's voice. But to dare to do it for such a famous beloved man as Fitzwilliam Darcy (not to mention such a famous beloved woman as the lady who wrote him in the first place) is risky indeed. I haven't got very far in it yet, but I do believe Amanda has pulled it off. I can hear Darcy's voice. I can feel his responsibility, his apparent detachment which gradually gets undermined. I am going to have trouble spending the requisite time with Seb and Neely tomorrow, I can tell. They are fun (especially now as Seb is having a close encounter with the bay) but Darcy is calling to me. And he's already written. It takes so much less effort to enjoy him than to enjoy Seb (even in a towel). So, thank you, Amanda, for the temptation you have sent my way. I'm enjoying it immensely. And thank you, Kate, for having so many wonderful friends who write so many wonderful books that now my TBR pile is higher than EVER. And especially, thank you to Max Ravenscar, the Heyer hero who won me my very own copy. In his honor I named a character in Seb's book Max. Max has come very close to stealing the story. Oh, dear. Bad Max.